Catalyst is seeking memories of the Apollo 11 Moon Landing! Catalyst wins Charity of the Year Award! Catalyst toilets get a makeover! FMC helps to inspire young scientists! Why settle for the usual when you can select the unusual for your meetings, presentations or training events? Catalyst is an educational charity housed in a Grade II listed building steeped in industrial history with fascinating exhibits and displays to provide an inspirational starting point for your delegates. 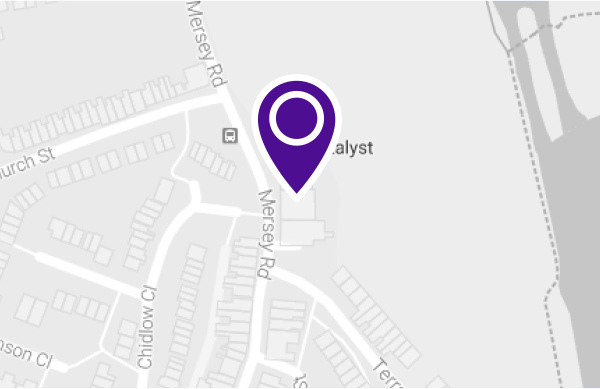 Catalyst is easily accessible from Merseyside, Manchester, Lancashire and Cheshire. We overlook the banks of the River Mersey, the new Mersey Gateway Bridge and are just 10 minutes from both the M56 and M62. We offer a first class catering service, superb value for money and a professional approach so your meeting at Catalyst will certainly be a memorable experience for all your guests. The Gossage Room offers a refreshing environment for presentations, meetings and training. Seats up to 40 people theatre style and 28 boardroom style. The Deacon Room is situated on the 3rd floor, with a great view of the River Mersey. This room is ideal for small meetings of up to 8 people. The Friends Room is also situated on the 3rd floor with great views of the River. This room seats up to 10 people boardroom style or 15 people for presentations. The Theatre, situated on the first floor has tiered seating that can accommodate up to 50 people for lectures and presentations. The Education Suite comprises three rooms, two of which can be opened into one larger room which can accommodate up to 100 people theatre style. Rooms can be hired separately and the facility provides a flexible space for exhibitions, meetings, presentations and seminars. The Discovery Lab can be hired for workshop sessions or training events and can accommodate up to 32 people. The Observatory Gallery is a glass-walled, rooftop gallery that affords stunning views over the river landscape, making it an ideal location for corporate hospitality functions. This area can accommodate up to 100 people. Download the room rates here. A high quality catering service is available – with a specially prepared selection of tempting menus. Whether you require creative canapes or a sumptuous buffet, we are pleased to assist you in your choice of menus or develop ideas to suit your specific needs.